Any attempt at resuscitation is better than no attempt when someone is suffering a cardiac arrest. Whether you’re trained or untrained, it’s essential to recognise a cardiac arrest, call 000, start chest compressions, and send for an AED (Automatic External Defibrillator). No matter whether you’re in the courtroom or at home, acting quickly is essential. 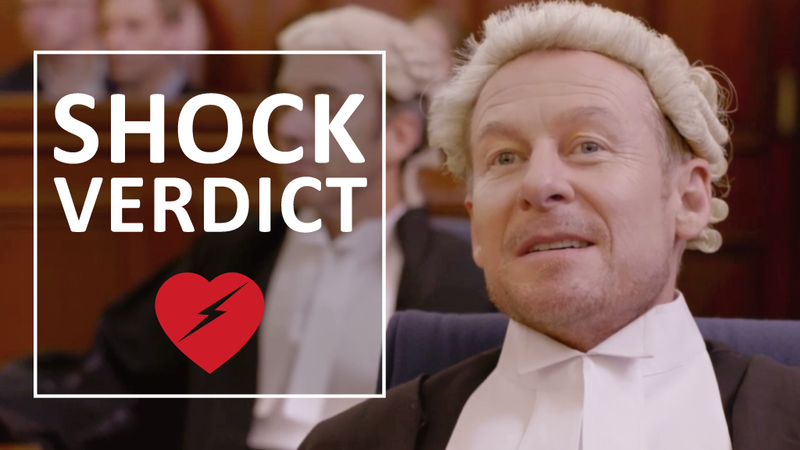 The cast of ABC’s Rake are joined in the courtroom by cardiologist, Dr Paul MacIntyre, and cardiac arrest survivors in the jury to receive a Shock Verdict. Shock Verdict hopes to inspire Australians to save a life by calling 000, providing lifesaving chest compressions and using an AED. In Australia, approximately 24,000 people will suffer an out-of-hospital cardiac arrest each year; approximately 10% of people survive. 75% of out-of-hospital cardiac arrests occur at home, making it likely that if you are in a situation to provide chest compressions, it will be for a friend or family member. The early provision of chest compressions and the use of an AED can nearly double the chance of survival from a cardiac arrest. The message is clear; recognise a cardiac arrest, call 000, start chest compressions, and use an AED. Check out our social media and share with your friends and family. The majority of cardiac arrests occur in the home, so you never know, sharing this video could save your life. Share Shock Verdict on social media; you never know, it may save someone’s life. While cycling one Sunday morning, I received a phone call from my wife, informing me that a friend’s father had collapsed with a heart attack during the Point to Pinnacle half marathon and had been taken to the Royal Hobart Hospital. As I am a cardiologist, she asked if I could drop into the hospital to enquire about his condition. I met him in our angiography suite and was told that he had suddenly collapsed after the start of the race and two senior nurses who were at the race were first to attend. They recognised that he had suffered a cardiac arrest and commenced CPR immediately. St John’s ambulance arrived and connected him to a defibrillator and a shock was delivered. Following the shock, he regained consciousness, sat up and asked what all the fuss was about and had to be persuaded to go to hospital. I asked one of the nursing staff involved in the resuscitation about what happened. I found out they had performed hands-only CPR to the beat of the Bee Gee’s song “Stayin’ Alive” as recommended in the British Heart Foundation’s Vinnie Jones CPR video which was released in 2012. That night I watched the video on YouTube and was left wondering if there was an Australian version. When I found out there wasn’t I thought it would be fantastic to have an Australian version, with directions relevant to Australian emergency services. When I initiated the project to make an Australian version of the Vinnie Jones video, I planned to continue the theme of delivering CPR to the beat of Stayin’ Alive. However, in recent years there has been an increased number of automated external defibrillators (AEDs) purchased by different organisations and available for use in the community. This has led to increased use of these devices for out-of-hospital cardiac arrest, with lifesaving consequences. I thought that the Australian version should include the use of an AED in a community setting to represent a more contemporary approach for out of hospital cardiac arrest. At the same time as this idea was emerging, I happened to be watching the ABC TV series “Rake”. This sparked the idea of a courtroom drama as a scene for a cardiac arrest for the Australian version of the resuscitation video featuring the stars of Rake with a “Shock Verdict”. 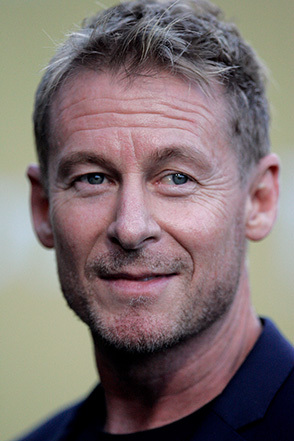 Richard Roxburgh, the main actor who plays Cleaver Green in the series is a well-known national celebrity. I was delighted when Richard agreed to take part. Richard wrote most of the script himself, with help from myself and my resuscitation officer Toni Dunbabin on the technical issues. The resuscitation video was filmed in Balmain Court House on the 4th July 2017 with Richard Roxburgh, Kate Box and others from the Rake drama. The video was funded by an educational grant from Biotronik. The campaign is supported by Laerdal Medical, Philips, University of Tasmania, the Tasmanian Health Council, the Australian Heart Foundation and the Tasmanian Health Minister. This is an initiative of the Australian Resuscitation Council, Tasmania Branch and is part of a National Health Campaign. The campaign intends to save lives by empowering untrained members of the community to perform bystander CPR, locate an AED and use it. I was very keen to be involved with the Shock Verdict CPR campaign. It’s a principle that every adult should have an understanding of, and yet Australia has historically had a low rate of successful use of CPR. The idea that dozens of lives could potentially be saved each year if Australians had the CPR basics at their fingertips makes the campaign incredibly important. Getting the message out in a fun way with Cleaver and Nicole seemed like an excellent idea. Paul graduated from Glasgow University, Scotland in 1987. He worked as a consultant cardiologist at the Royal Alexandra Hospital in Glasgow, before moving to Tasmania in 2011. He was clinical lead for the Have a Heart Paisley, a coronary heart disease prevention project from 1999-2005. In 2005 he was appointed as Lead Clinician for Coronary Heart Disease in Scotland and Chair of the National Advisory Committee to the Scottish Government. Paul was recognised for his contributions to the profession with a merit award for Cardiology in Scotland in 2007. 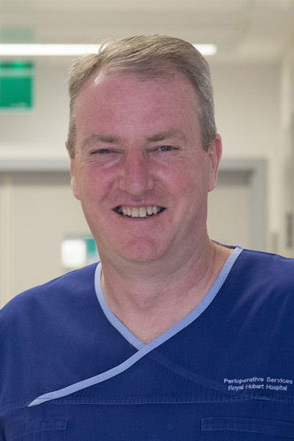 Paul is currently the Director of Cardiology at the Royal Hobart Hospital and has clinical interests in heart failure and device therapy and cardiac rehabilitation. He is a director of the Australian Heart Foundation, Tasmania and is a member of the Tasmanian Health Advisory Council to the Health Minister. He initiated the Australian resuscitation public health awareness campaign.